How to choose a new fridge? When it comes to the kitchen appliances refrigerator is one of the most important parts of any kitchen and play an essential role in preserving the food from spoiling and keeping the family healthy. It should be big enough to fit necessary groceries for the week and match with kitchen décor overall. In order to choose the fridge that would work best for your kitchen, it is an essential to do the right measurements of height, width, and depth for the space available to a new appliance before heading to the store or start looking online. Accordingly to that numbers, you need to match refrigerator dimensions with existing kitchen cabinets opening in order to avoid changes in kitchen layout unless it is a part of complete remodeling project. Other thing to consider is which type of fridge you prefer - side-by-side, top-mount or bottom-mount freezer. Side-by-side refrigerator doesn’t need much clearance for the doors. The wide-open design of the fridge will give you a view of all food items that you have there. Bottom-mount fridge puts the most-used food items at eye level and an easy access to it for adults and difficulty to reach for small children. Frozen food will locate on the bottom in separate section and you need to bend to see and reach it. Top-mount refrigerator has been the most popular model for years. However, it slowly gives up its positions now to other more feature-rich models. Functionality of your refrigerator is also very important. Therefore, you need to compare sizes and shapes of shelves and drawers, their placement in the fridge in order to figure out what is more suitable to your family needs. You also should consider some other features of fridge, such as capacity, number of chambers, and the defrosting type. Additional things to think about are the number of compressors, energy efficiency, and the manufacturers. For some people it is important to have some additional functions like a sound signal of the door, when their fridge is being open for a long time. Then you need to read the product description to know which features a particular fridge model has. Budget consideration is an initial factor of successful purchase. 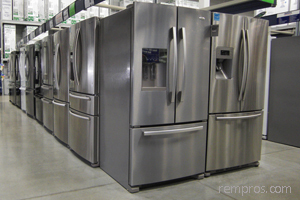 Normally top-mount refrigerators are less expensive than other models available on the market now. But trying to go for a cheaper option, you still should analyze the reliability of particular fridge model first. Since refrigerators turned on all the time (24 hours a day, 365 days a year) they consume a lot of electricity. Energy efficient fridges will be a good choice of reducing the electricity consumption. They actually will save you money in a long run by lowering your electrical bills. If you consider keeping old fridge which is not energy efficient or buying a new one, you can lean for purchasing it just because the new kitchen appliance will pay off itself in a few years just by lowering utility expenditures. Reliability of the fridge will not depend on its brand only. Even the most expensive model of a fridge can have some defects. Normally refrigerators will last for many years as long as its motors will work properly. Therefore, when you buy a fridge make sure that you have a warranty on it and know what is covered. Ask also how extended services will work in order to avoid some potential problems after the warranty will expire.